To compare diagnostic performance of magnetic resonance imaging (MRI) and endoscopic ultrasonography (EUS) for differentiating malignant from benign intraductal papillary mucinous neoplasms (IPMN) and mucinous cystic neoplasms (MCN) of the pancreas. This retrospective study included 55 patients with 47 surgically confirmed IPMNs (12 malignant, 35 benign) and eight MCNs (two malignant, six benign) who underwent contrast-enhanced pancreas MRI and EUS. Contrast enhancement was not routinely used at EUS examination. Two observers independently evaluated the MRIs, and another reviewed EUS images. They recorded their confidence for malignancy with each imaging modality. We calculated diagnostic performance using the area under the receiver operating characteristic curves (A z ), and to determine the accuracy, sensitivity, specificity, and positive (PPV) and negative predictive (NPV) values. The A z values of MRI were higher than those of EUS (0.712 and 0.688 for MRI vs. 0.543 for EUS; p = 0.007). The diagnostic accuracies (74.5%), specificity (78.0% and 80.5%) and PPV (50.0%) of MRI in two observers were higher than those (56.4%, 58.5% and 29.2%, respectively) of EUS (p = 0.013–0.049). MRI showed better diagnostic performance than EUS for differentiating malignant from benign pancreatic IPMN and MCN. • The A z values of MRI were higher than those of EUS. 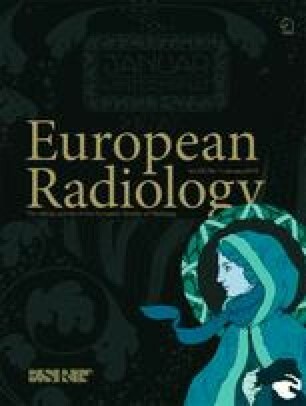 • The diagnostic accuracies of MRI were higher than those of EUS. • The specificities of MRI were higher than those of EUS. The scientific guarantor of this publication is Young Kon Kim in the Department of Radiology and Center for Imaging Science, Samsung Medical Center, Sungkyunkwan University School of Medicine, Seoul, Republic of Korea. Soohyun Ahn PhD and Hyeon Seon Ahn MS in Biostatistics and Clinical Epidemiology Center, Research Institute for Future Medicine, Samsung Medical Center, Seoul, Korea. kindly provided statistical advice for this manuscript.